Are you looking for a healthy side dish? How above giving this Grilled Avocados with Corn and Tomato Salsa recipe a try. Its healthy, easy to make and something that we think you’ll enjoy especially if you love Avocados. 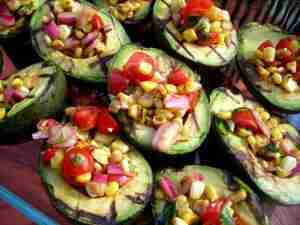 The Grilled Avocados with Corn and Tomato Salsa ingredients are listed below. The Grilled Avocados with Corn and Tomato Salsa ingredients and cooking instructions can be viewed through the link below.